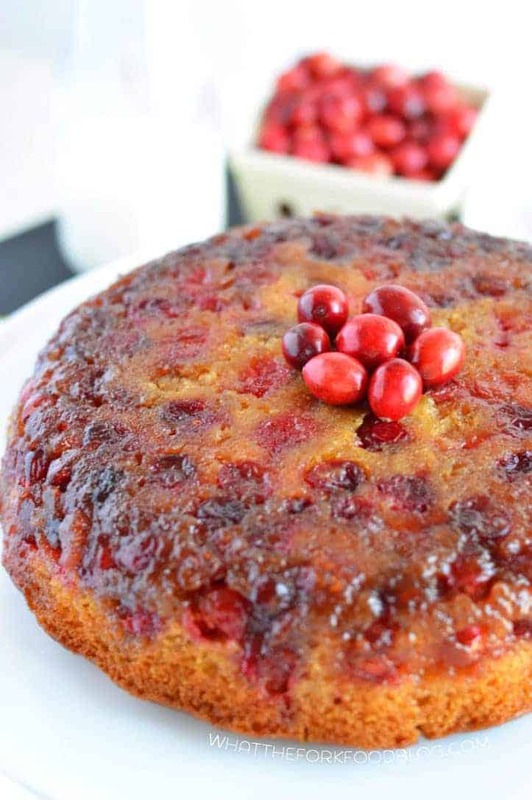 This Cranberry Upside-Down cake is the perfect combination of sweet and tart. Fresh cranberries are the star of this delicious dessert. Serve it for Thanksgiving, Christmas, or any time of the year – your guests will leave satisfied and happy! Cranberries are one of those fruits that seem to have a single, yearly purpose and then they’re forgotten about until next year. Today, I’m here to tell you that cranberries are not a once-a-year food. They’re so much more than cranberry sauce and they’re perfect for so many different recipes. Plus, you can use them year round! 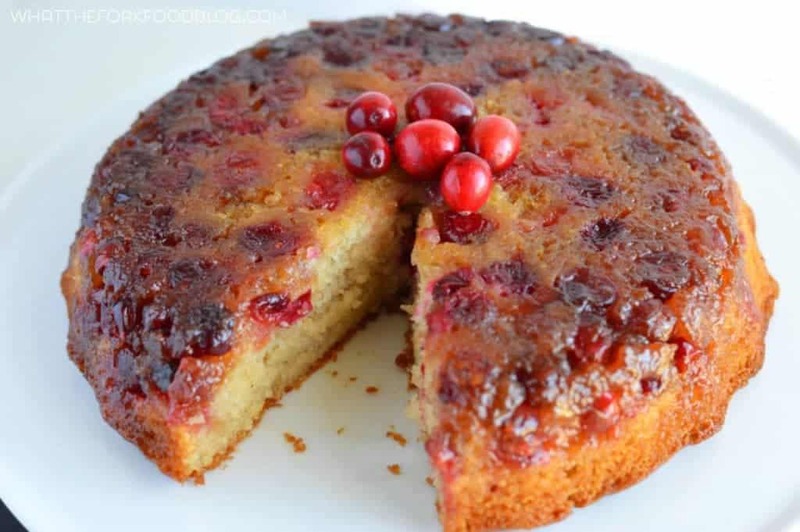 I teamed up with Bridges Produce and Patience Fruit &, Co. to bring you this fabulous cranberry upside-down cake today. I met the great people behind Bridges Produce during my trip to Atlanta for PMA’s Fresh Summit. 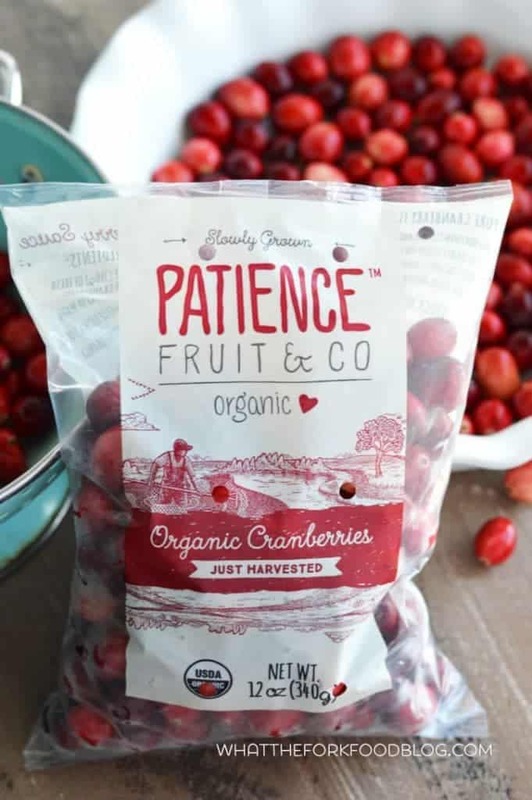 Patience Fruit & Co. produces sustainably grown organic cranberries in Quebec, Canada which are in season late September through late December. Fresh cranberries keep really well in the refrigerator and they also freeze really well. You can stock up now and freeze any extra to use the rest of the year, which is exactly what Adam’s grandparents do. Cranberries are great in desserts (like this!) 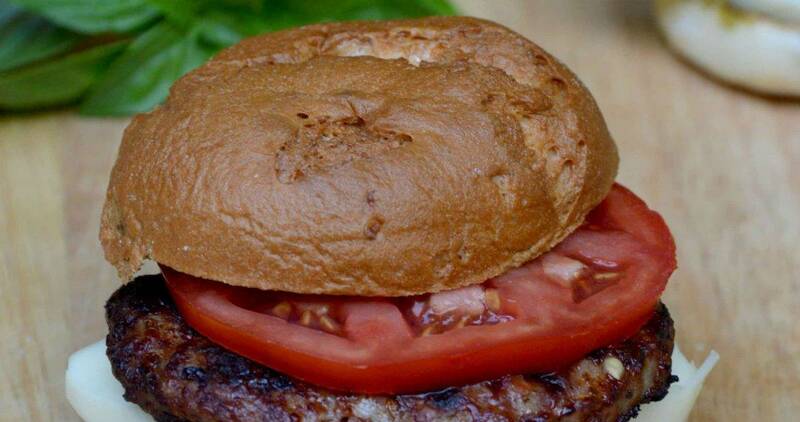 and they’re even delicious with meat other than turkey – like pork! I LOVE cranberries with pork, so wintery and delicious! Last year, I shared my slow-cooker cranberry sauce and my cranberry orange bread with you. 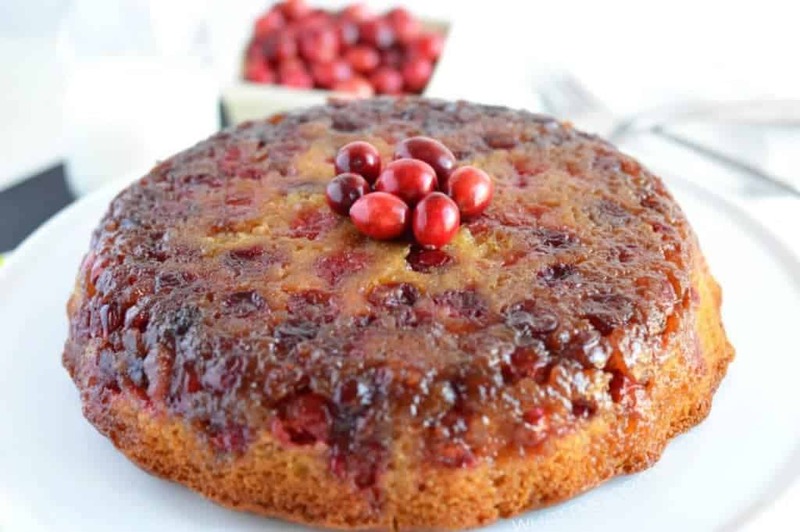 This year, I’m going beyond the basics and I made a spectacular cranberry dessert: Cranberry Upside-Down Cake. And ohmygerd is it good! Also, next month I’ll be posting a Cranberry Orange Sangria. Can’t get through the holidays without a drink! 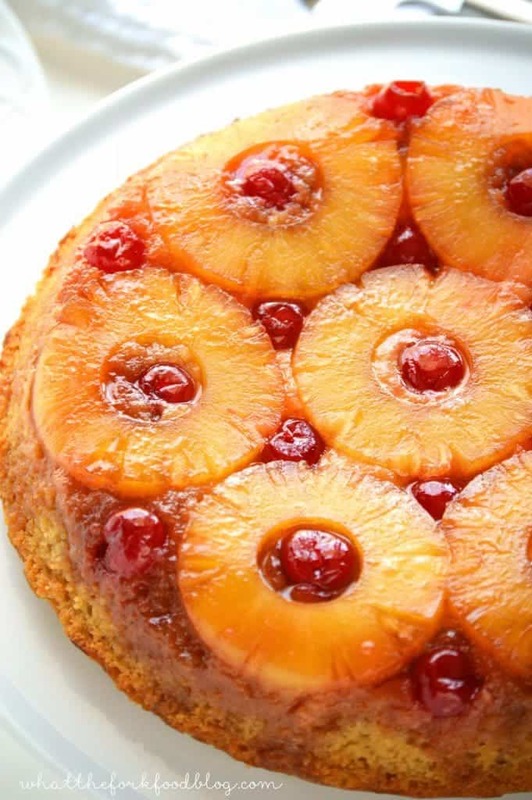 I adapted the cake from my pineapple upside-down cake and let me tell you, that was a really good cake. BUT, I think I like this version more! There’s so much going on here; moist and flavorful yellow cake, sweet caramelized brown sugar glaze, tart cranberries… so, so good! Top it with some vanilla ice cream for an even greater experience! Enjoy! 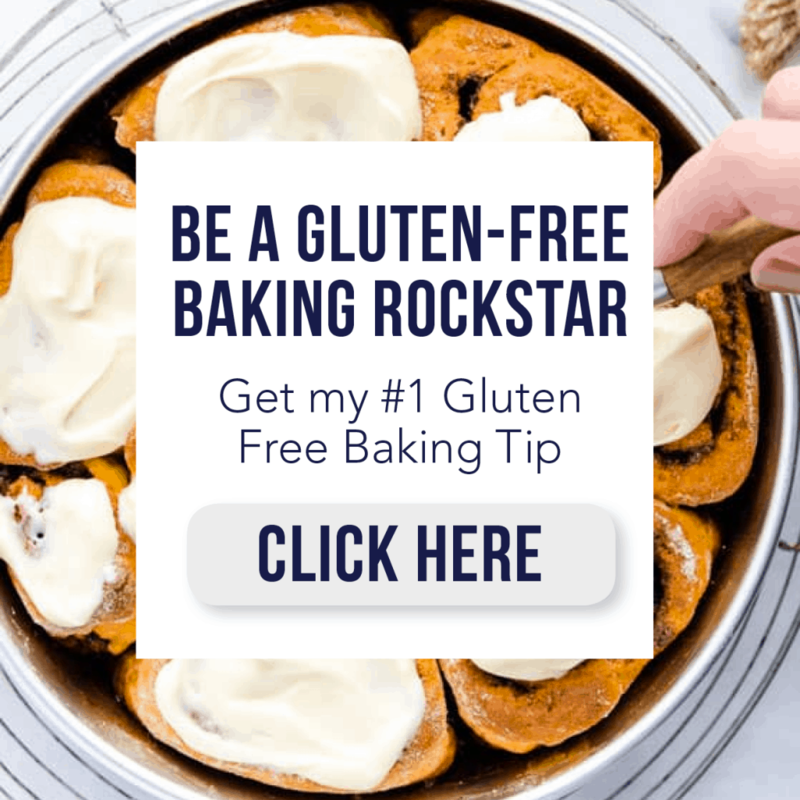 PS- If you’re looking for more fall classic dessert recipes, you have to try Michelle’s Gluten Free Apple Streusel Pie from My Gluten-Free Kitchen. 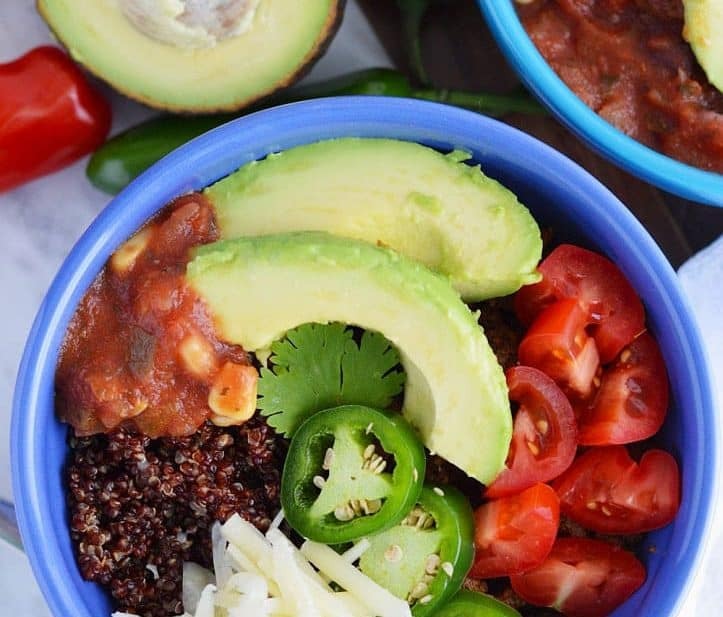 It’s easy to make and packed full of flavor! Melt the 1/4 cup of vegan butter and pour over the bottom of a 9 inch pie plate (preferably a deep dish but regular will work). Sprinkle 1/2 cup of light brown sugar evenly over the butter and top with the fresh cranberries. In a large bowl, whisk together the flour, granulated sugar, 3/4 C brown sugar, xanthan gum, baking powder, baking soda, and salt. In a separate bowl, whisk together the vegetable oil, egg, yogurt, milk, vinegar, vanilla, and almond extract. Pour the wet ingredients into the dry ingredients and mix well. Pour over the cranberries and spread the batter evenly in the pan. Bake at 350 degrees for 45-55 minutes or until a cake tester comes out clean. Mine took 45 minutes in my convection oven. Cool in the pan for 10 minutes then invert onto a cake stand or plate. Serve warm or room temperature. Leftovers can be stored covered at room temperature for several days. For a non-dairy free version use regular butter, yogurt, and buttermilk in place of the melted butter, coconut milk, and vinegar. 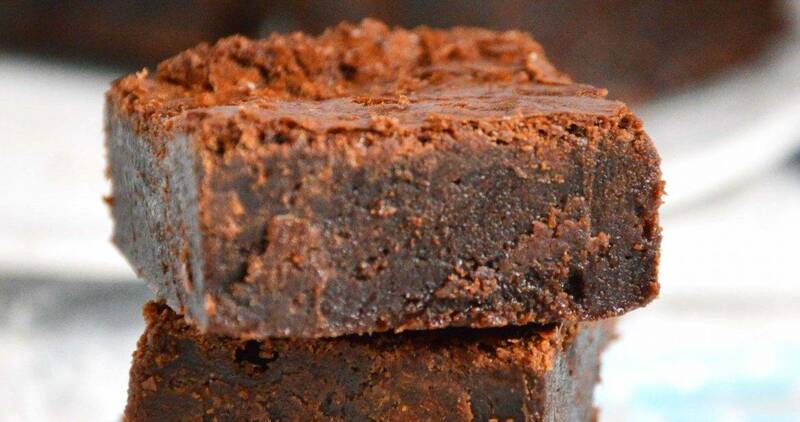 *Use regular all-purpose flour in place of the gluten free flour and omit the xanthan gum for a non-gluten free cake. 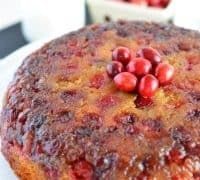 I’ve never made any type of upside down cake 😛 But this is a perfect way to sweeten up tart cranberries! 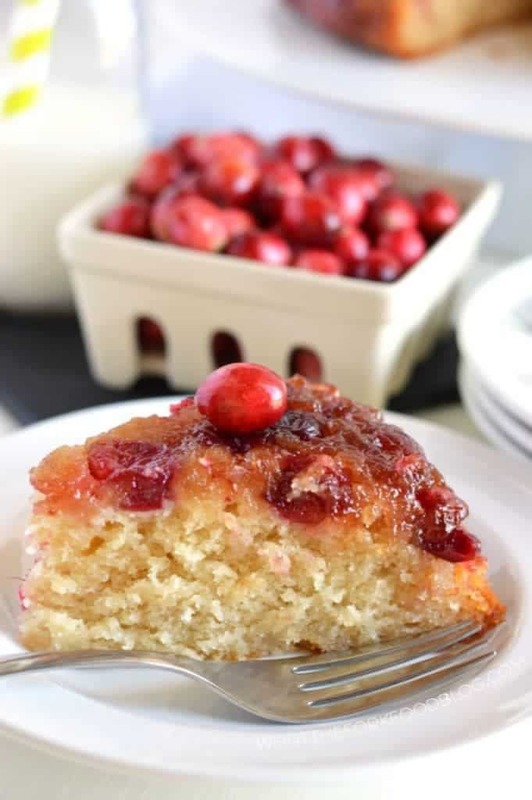 This is a great way to use cranberries! 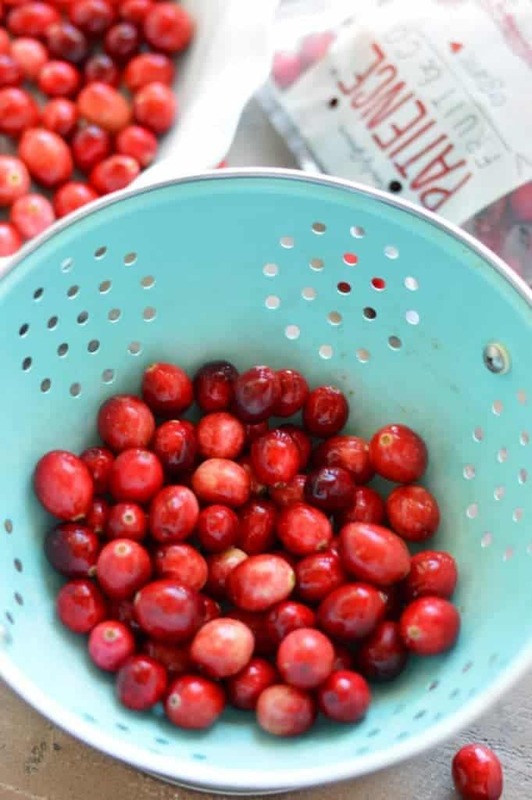 I have a bag sitting in my freezer as we speak but I plan to pick up more so I have them all year round 🙂 There is just something about fresh cranberries that transforms a dish! What a perfect dessert for thanksgiving! And so pretty too! It looks to delicious! What a beautiful looking cake! I’m obsessed with cranberries this time of the year. This looks absolutely divine! So in keeping with the holidays yet bright. Such a festive looking cake! I love baking with fresh cranberries. So tart and delicious! I love cranberries. We have local farms here in Oregon. I am working on a cranberry brunch coffeecake…great minds think alike…and those cranberries!! SO beautiful Sharon!! I’m always looking for new ways to use cranberries during the holiday season. This looks like a winner! This is one gorgeous cake, Sharon! And I love using cranberries in holiday baking. And vanilla ice cream would be the bomb. WOW! This is genius! Anything cranberry and I’m in! I love to bake with cranberries! I just bought two bags to make cranberry bread and scones! I love baking with fresh cranberries! This upside down cake is absolutely gorgeous…the perfect holiday dessert! Sharon, this looks divine! May have to try it next week! Thank you for sharing! This is one tasty cake! I made it today to test it out for the holidays. It is a keeper! Thank you again Sharon, for another great recipe! Glad you like it! It’s got such an addicting flavor with that sweet/tartness going on! Curious why you used vegan and dairy free then added an egg? Hi Sarah – I use vegan and dairy free products sometimes because they work well for my lactose intolerant daughter. I use eggs because they’re not dairy products and we don’t have any issues with eggs.